One of the maps in the Greater CoProsperity Sphere series and one of the most cartographically beautiful 20th century maps of New Zealand. This is a stunning large format Japanese map of New Zealand dating to World War II, one of the maps in the Greater East Asia Co-Prosperity Sphere set. 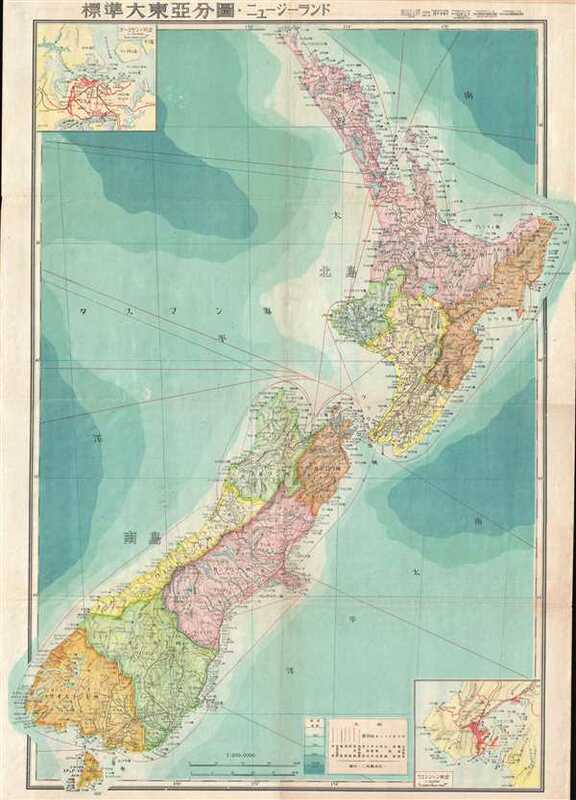 It is one of the most beautiful cartographic depictions of New Zealand to appear in the 20th century. The map depicts the entirety of New Zealand, including the North Island and South Island with an inset of Auckland in the upper left corner and an inset of Wellington in the lower right corner. Superb detail is illustrated regarding both topographical and political elements, noting cities and roads as well as air and sea routes. Blue shading is used to indicate oceanic depths. The Greater East Asia Co-Prosperity Sphere (大東亜共栄圏) was an imperial concept created and promulgated for occupied Asian populations during 1930-45 by the Empire of Japan. The concept was announced by Hachirō Arita on June 29, 1940. The Co-Prosperity Sphere was intended as a self-sufficient 'bloc of Asian nations led by the Japanese and free of Western powers.' It covered Southeast Asia, Eastern China, Manchuria, Japan, the East India Islands, and parts of Oceania. The idea promoted the cultural and economic unity East Asians, Southeast Asians, and Oceanians. This map was number 17 in the 20-map series Greater East Asian Co-Prosperity Sphere which was issued a between 1942 and 1944. The Co-Prosperity Sphere map series as published by the Japan Publishing and Distribution Company, Ltd. (日本出版配給株式會社). Very good. Even overall toning. Wear along original fold lines. Blank on verso.